Avalanche Warning for the North San Juan Mountains. HIGH Danger (Lev 4 of 5) expires 6:00AM 3/15. Respect road closures. 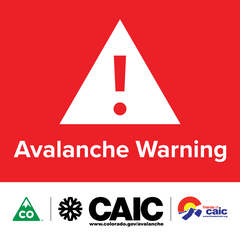 Avalanche Warning for the North San Juan Mountains.
! !DO NOT LET BLUE SKIES FOOL YOU!!
! !Respect Road Closures!! Closed Kendall Mtn Road, Shrine, CR 110 and CR 2. * PRECAUTIONARY/PREPAREDNESS ACTIONS...Backcountry travel is very dangerous. Do not travel across or below steep slopes. Avalanches could run long distances.